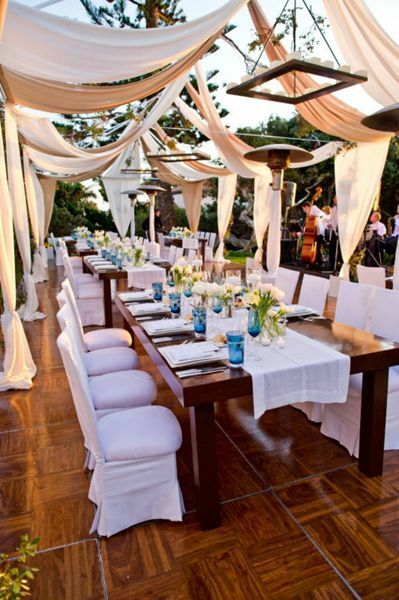 If you're planning a Summer Wedding reception what is your theme? The wedding reception is considered the main course of a wedding celebration. This is were your final memories and family gathering takes place so it is important that your presentation is fantastic. We have gathered our favorite looks for summer inspired by LA urban city lifestyle and beach settings. This is a perfect season for fresh flowered center pieces and soft color schemes. 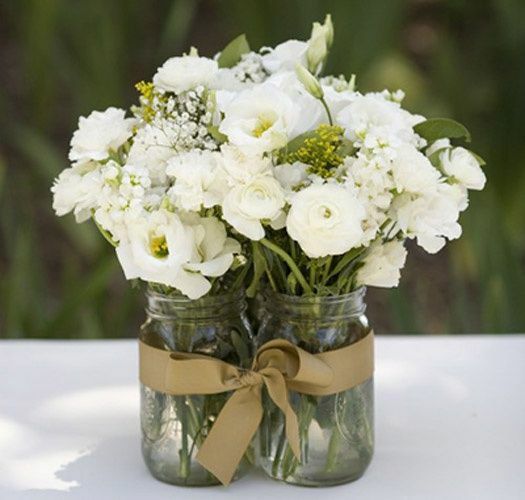 Flowers settings can range from white roses, yellow tulips, dahlias, daffodils, lilies, and orchids. 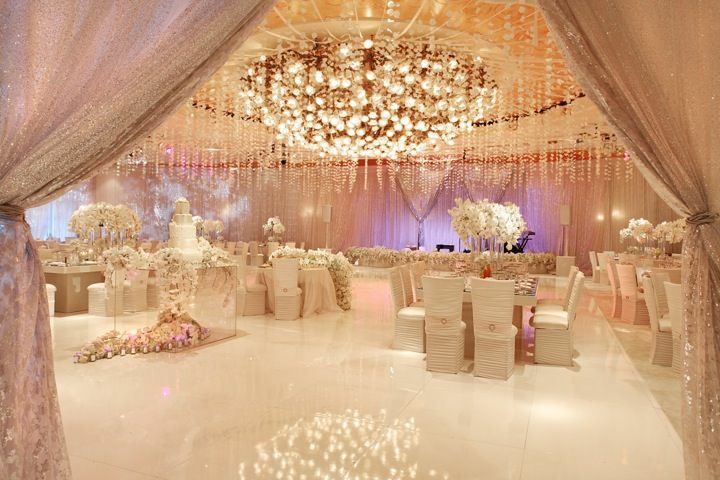 White tables cloths and your choice of color can be the base of your receptions entire look. Here are our top picks for summer wedding receptions. Use these ideas to create your ideal wedding theme. 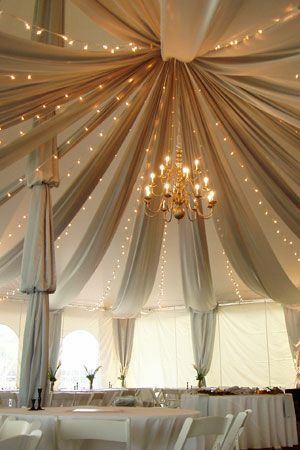 There is something magical about the wedding tent. 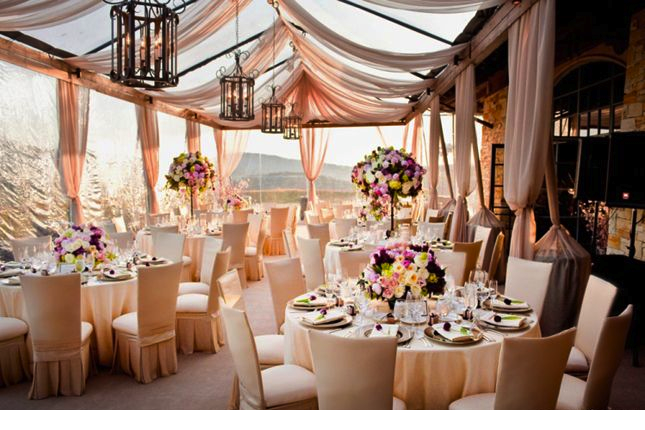 Long white and ivory colored drapes decorated with garden lighting make a romantic environment during the summer. Your location can be in a garden area or spacious backyard, somewhere that has a combination of grass, trees, and tile. The styled settings below are inspired by our favorite wedding looks on pinterest. 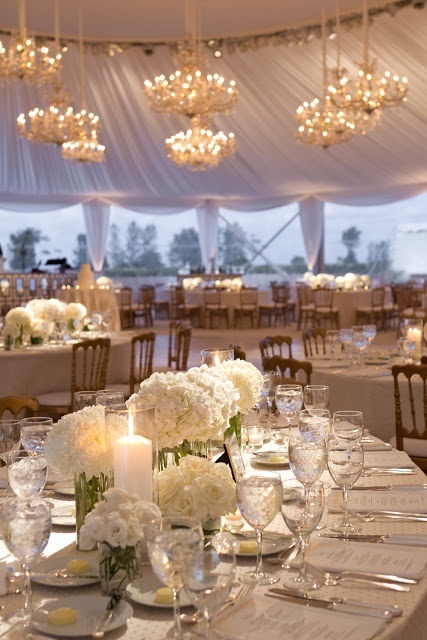 Consider the wedding tent for an intimate outdoor wedding reception. 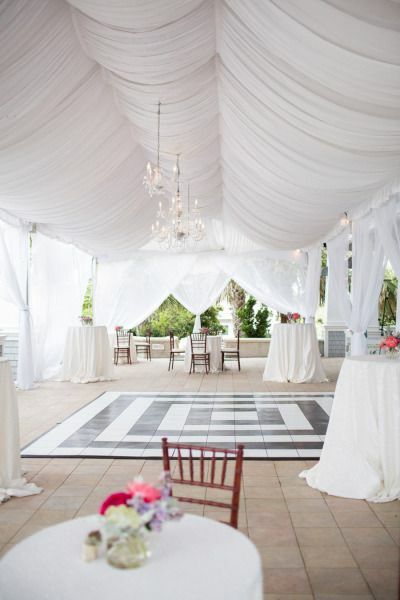 Outdoor tents create an elegant layout that can be dressed up or down. If glamour is your forte then you can choose white drapes and table cloths with a royal gold accent on all table setting details. This would include center pieces vase, plates, utensils, cups. You can turn an earthy environment to an outdoor royal palace. 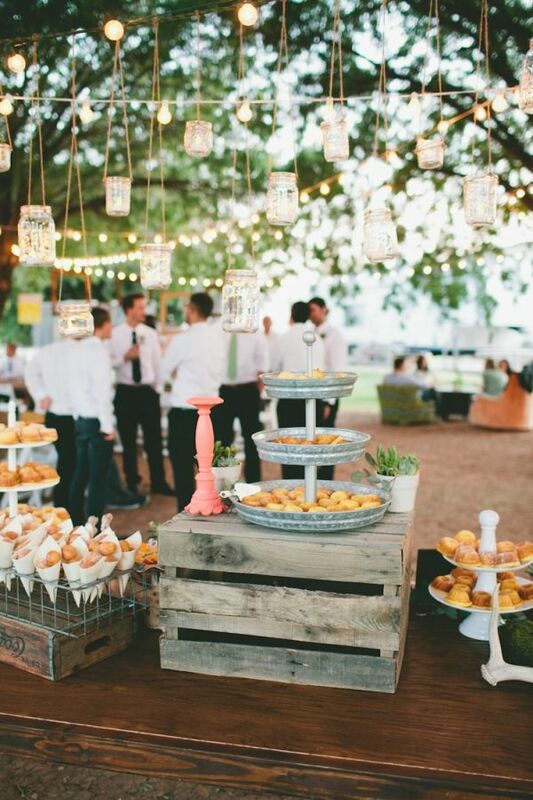 The simple outdoor garden or barn wedding themes also makes up for a sweet/ stylish event. This option allows you get creative and add in personalized party favors, dessert tables, refreshment stands, and perhaps a fun photo booth for you guests. A few words that could describe an outdoor wedding set up would be, soft, light, sweet, detailed, romantic, fresh, animated, and magical. If your are planning an outdoor wedding set up think of a garden labyrinth filled with lights, candles, flowers, and peaceful music. You have the option of choosing small round tables if your guest list is small or long table seating for a big wedding event. The pictures below are some ideas for a outdoor glamour and a casual outdoor setting. Party favors and goodies for dessert stands are a fantastic touch for your theme. Guest's love to mingle and indulge on tasty sweets. Rich dark chocolate, mill chocolate covered almonds, and personalized candy bars are great choices for the glamour candy bar. Casual settings can be a little more fun and creative such as mini doughnut cones, smores, blueberry muffins, or the bride and grooms favorite cookies. We didn't know whether to stick to glitz and glam or showcase the rustic garden theme so use this mixture of our favorite looks to your advantage and plan your dream wedding. Oh and of course we wouldn't want to miss out on a little fun! Outdoors means Outdoor fun! Use lamps, mason jars, or sparklers for decoration. Personalized sparklers would make a memorable ending to your special day and great activity for all guest to interact. The City in the Summer is also a beautiful place to have your wedding reception. Some of the best summer nights in LA happen on fancy roof top bars looking over tall buildings, busy street dining, and highway lighting. If you live in the city you have plenty of option on venues. Ideas for a reception can take place in a hotel venue, roof top venue, library event room, large studio, or outdoor restaurant venue. These locations consist of metropolitan style ambiance. You will see a lot dark color schemes, stylish wall paper, chandeliers, gorgeous lighting, art painting if you choose an art studio or indoor spaces with large windows on rooftop views. Choose a location with a nice bar area and dance floor setting for guests. Here is a series of our favorite city looks. Steel these ideas for your dream city wedding. 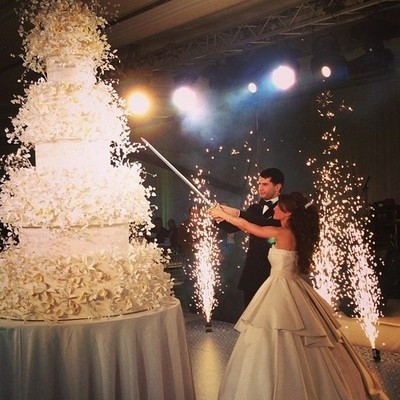 We hope to have sparked some ideas for your wedding day. We want to know what your wedding theme is and what your favorite looks are. Follow LeZari & Co. on social media and feel free to comment on all lifestyle posts and creative ideas. We love interacting with our followers and want to know more about your bridal/engagement plans.